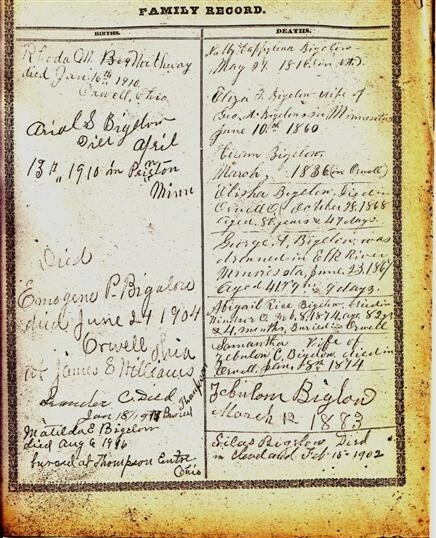 16313.334 Ariel Stevens 8 BIGELOW, son of Elisha 7 ( Timothy 6 , Amasa 5 , David 4 , Lt. John 3 , Joshua 2, John 1), and Abigail Rice (CRANE) BIGELOW, was born at Brookfield, Orange co, VT on 23 June 1822 and married on 15 September 1844 in Ashtabula co, OH, Artilissa Ann Reeves. She was the daughter of Simeon and Statera ( ) Reeves and born 1822 in OH. this family moved to Royalton, MN in the early 1850's from OH. Ariel was a peddler and blacksmith. She died at Princeton, MN 02 November 1895 and he at Blue Hill, MN on 13 April 1910 (see below). 16313.3341t Martha Matilda, b 27 Jan 1846 Sheffield, Lorraine co, OH; d 02 Feb 1933; m 25 Dec 1867 Thomas Asbury Fisher, (a butcher) in Princeton, MN. 16313.3344t Emogene Gertrude, b 29 July 1853 Orwell, OH; d 23 May 1924; m 23 May 1871 Smith Soule. 1850 census Sheffield, OH; vital records OH. I have attached some old Bible inserts that may have some connections.